EPHRAIM—A woman described as “an angel to her family” and a man who has lived a “life of service to family, community, country and the advancement of education” were the honorees at the Ephraim Middle School Candlelight Service last week. 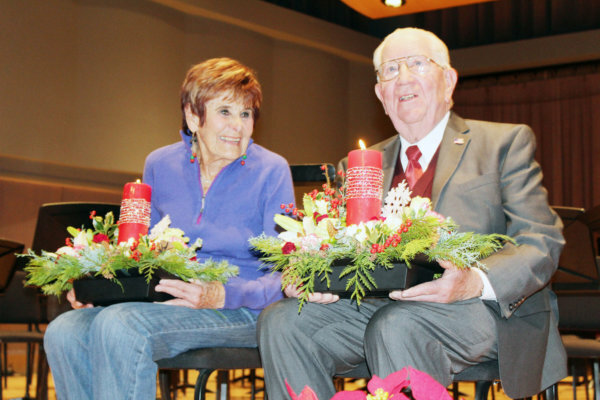 It was the 68th year that the middle school, as part of its Christmas music concert, presented candles festooned with evergreen boughs to two residents—one from the Manti-Sterling area and one from Ephraim—recognizing a lifetime of service to family, church and community. 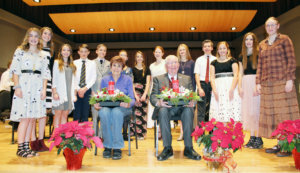 Kaystan Larsen escorts Carol Nielsen to podium after she is named one of the Ephraim Middle School candle recipients. The recipients were Carol Poulson Nielsen, who was born and raised in Ephraim, and who, besides raising four children as a single mother, worked more than 25 years as a paraeducator in local schools, and Vaughn Mickelsen of Manti, who served in the military, taught in secondary schools, was a justice court judge and served on the Manti City Council. The program last Wednesday, Dec. 12 at the Eccles Center for the Performing Arts kicked off with performances by the middle school jazz band, symphonic band and seventh and eighth grade orchestras. As the band played spooky sounding takeoffs on familiar Christmas songs, Richardson told the story of what happens when a child has been naughty: Santa doesn’t come and “Krampus” comes instead. Following the Krampus tale, the seventh and eighth grade orchestras, led by Lisa Murray, played mostly classical numbers, including the Hallelujah Chorus and themes from the Nutcracker Suite. Then it was time for 13 eighth graders who had earned straight A’s in sixth and seventh grades to present the Christmas candles. Principal Tim Miller read a tribute to Nielsen. As a young woman, she married her childhood sweetheart, David Nielsen, and had four children, Craig, Kaye, Doug and Karl. She now has 18 grandchildren and 43 great-grandchildren. After 17 years of marriage, her husband was killed in a trucking accident. The tribute said she is grateful for help from family and community in raising her children. But her children and community are equally grateful for her, the written tribute suggested. Her years as a paraeducator included work in special education at Gunnison Valley Middle School, assisting in kindergarten at Ephraim Elementary School and 22 years in resource classrooms in the district. 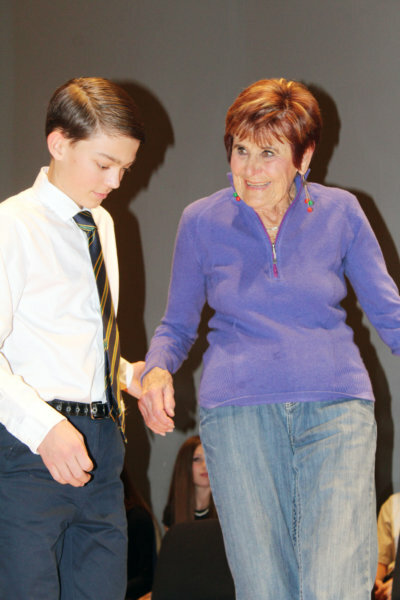 Though retired, she continues to volunteer at Ephraim Elementary School helping children with reading. According to the tribute read at the Candlelight program, while serving as Relief Society president in her ward in the Church of Jesus Christ of Latter-day Saints, she met many older women in the community. Although no longer Relief Society president, she has continued to care for the senior women by taking them to lunch, giving them rides or calling to check on them. 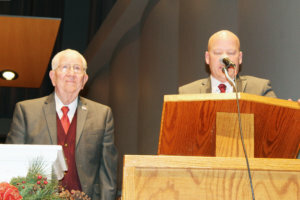 Ephraim Middle School principal Tim Miller (at podium) introduces Vaughn Mickelsen as one of the candlelight honorees. Then Miller, the school principal, read a similar tribute to Mickelsen. He was born and raised in Salina and attended North Sevier High School. During the Korean War, he enlisted in the U.S. Air Force and became an aircraft electrician and instrument specialist at a base in Alaska. Later, he served in the Air Force Reserves, and ultimately became a first sergeant in the 145th Field Artillery unit of the Utah National Guard, based in Manti. In all, he served for 29 years in the military. He attended Snow College, graduated from Utah State University in history, and did graduate work at Stanford and Michigan State. He married Ruth Chapman of Manti. They had four children, Lance, Leah, Larry and Lynette. Ruth died of cancer in 1988. Mickelsen then married Mary Kay Christensen of Moroni. About that time, he retired from teaching, “but he didn’t retire from life,” the tribute said. He was a justice court judge in Moroni and Manti for 12 years; a Scoutmaster for 20 years; served two terms on the Manti City Council; and served in the bishopric and on the stake high council in the Church of Jesus Christ of Latter-day Saints; and he and Mary Kay served two missions to Australia. 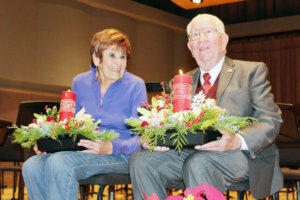 Carol Nielsen of Ephraim and Vaughn Mickelsen of Manti are center stage at the Eccles Center after receiving Christmas candles during the Ephraim Middle School Candlelight Service. Today, he continues to tend his 170-acre farm west of Manti and grow a large garden. “As a community, state and country, we are all better for Vaughn Mickelsen’s efforts,” the tribute said.